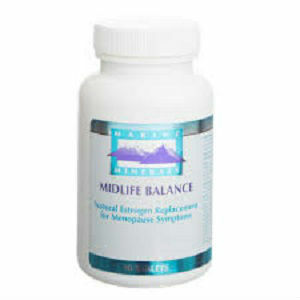 Marine Minerals Midlife Balance is a natural supplement designed for women battling with hormonal imbalance, mainly caused by menopause, but not only. A wide variety of symptoms are usually accompanying the onset of menopause, such as insomnia, hot flashes, and mood swings. One of the best natural remedies for hormonal imbalance in women is wild yam, a herbal extract that is known to increase the production of progesterone, without causing side effects. This is the natural remedy Marine Minerals Midlife Balance is based on, along with other natural ingredients. A closer look is necessary to understand whether this product is a good choice for you or not. What Does Marine Minerals Midlife Balance Contain? The formula for Marine Minerals Midlife Balance is quite complex, as you can easily see. Most of the ingredients are herbal extracts, combined with minerals and vitamins which are necessary to combat the effects of aging. The recommended dosage for this natural supplement is 6 to 9 tablets daily. The above figures are valid towards one serving, or 6 tablets. A bottle with 90 capsules or the supply for 15 days is priced at 30USD. The company making Marine Minerals Midlife Balance offers 60 days money back guarantee for your purchases. Marine Minerals Midlife Balance looks like a good, reliable product, because it contains a lot of traditionally used herbal remedies, along with vitamins and minerals, so it may be quite effective for alleviating the symptoms of menopause. However, the fact that you need to take so many pills daily does not make it a good deal, and you may want to consider other options. Jackie Horowitz	reviewed Marine Minerals Midlife Balance	on March 30th	 and gave it a rating of 2.